love the camera, and Howl's Castle frakin' amazing. Oh wow whenindoubtsew! That Howl's castle badge is amazing Love the beading too. My felt badges from Lindy have been hanging in the postal black hole. They finally were delivered today and are awesome. The Popsicle was Lindy's first attempt at needle felting! Terrific job! I love the way she used different stitches and colors to bind the badge, and the reverse coloring on each popsicle. This is so cute and looks so cold, what we all need on a hot day! Next up is an adorable vintage looking freeform flower. Lindy used my kitchen colors turquoise and pale yellow. Then the retro/vintage lace sandwiched between the two layers is such a creative touch. This will definitely become a refrigerator magnet for my 50's retro kitchen! Thank you Lindy for such well thought out and creative badges, I Love them!!!! Wow, an incredible explosion of badges- can't pick a favourite, but Stickerchick's wee dragonfly is adorable, the details on whenindoubtsew's castle is mindblowing, kimchery's gnome is really cute, MeganCrafts - I love the detail on the crafty badges! They really look awesome, and Lindy, the popsicles are a wonderful idea! Living in the land of (nearly) eternal sunshine. I love them! I've decided that I can't risk any of my badges so all five of them are being turned into magnets! I can't wait to put them on my fridge. I received from my talented partner Faux_Valentine! Look at these beauties! i`m in love with this 2-headed giraffe! . 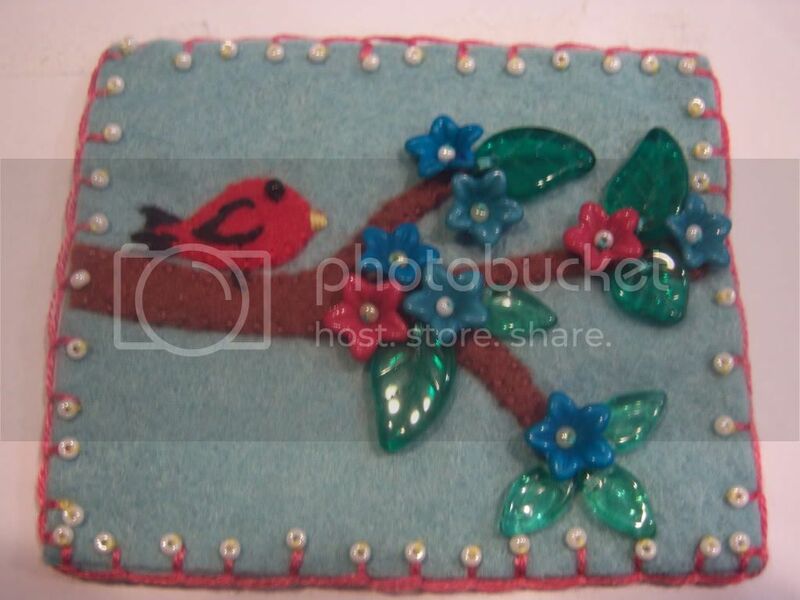 She did an awesome needle felting job! * and I LOVE all the fabulous stitchery pieces here- I couldn`t embroider such nice stitches for the life of me:P (like the R2 and somany others). Cute badges Petskin! The giraffe(s? ) are great Nice work Faux_Valentine! And the uni-pirate-zombi/corn is so cool, what a wonderful way to tie the package together! I received from Quaggy - 2 awesome badges! One is a beehive, which I adore. I had mentioned my love of bees so I was excited to see this one! Then, an adorable little house! I love the use of charms, and I am crazy about tiny houses! 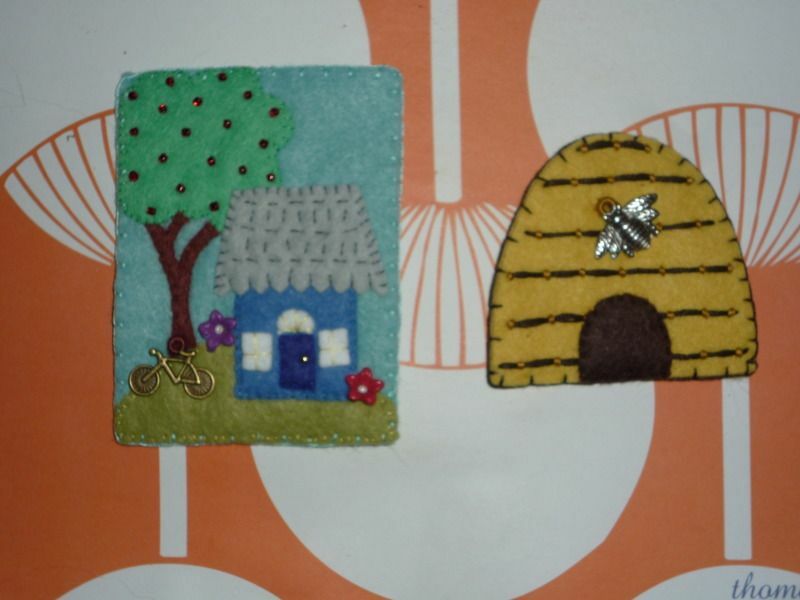 So, 2 awesome badges + 2 types of homes = one happy Batgirl!! I am so glad those badges finally made their way to you quaggy! I was getting ready to re-make them! I love all the unicorns, the beehive, and super cute giraffes! I received to gorgeous badges from quaggy last night too! Both fit my tastes so well! She made me a wonderful hen that is based off the one that was made by Leslieshappyheart (which I had pinned). 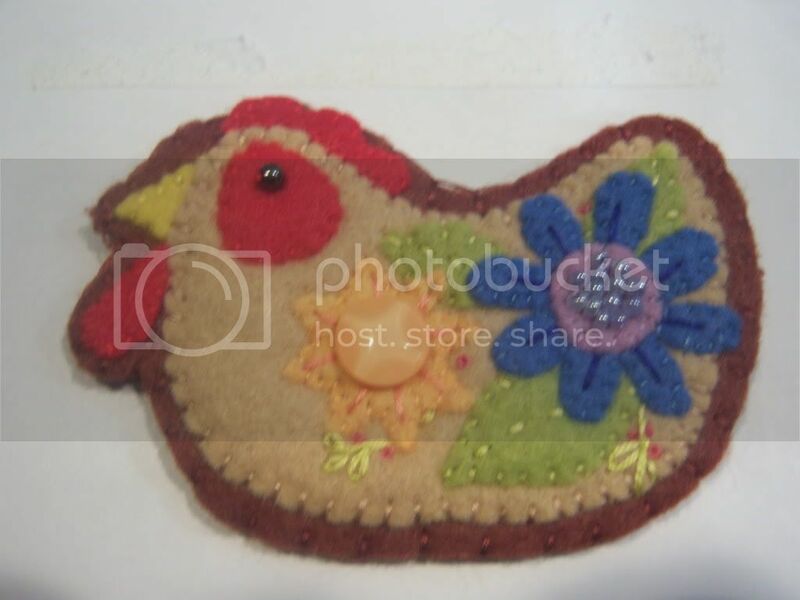 I am going to find a little hoop to put her in and hang her in my kitchen since she matches my kitchen decor and colors! She also sent this amazingly detailed little branch. I love the flower beads and details around the edges so much!!! Thank you so much!!!!! I feel so spoiled and am ready for round 3! Those are both awesome! Quaggy rocks!